News — Make a Spectacle of Yourself! 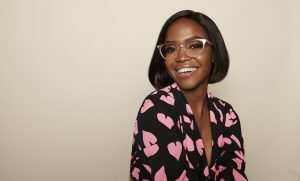 TV’s favourite dance diva Oti Mabuse has high-kicked off the search for the UK’s proudest glasses wearers in Sunderland – with a £10,000 cash prize up for grabs. The star of Strictly Come Dancing and The Greatest Dancer showcased her own stunning specs style in a new photoshoot, as she launches Specsavers’ annual search for the Spectacle Wearer of the Year 2019. Oti – who swaps her specs for contact lenses when she hits the dancefloor – says: ‘I’ve been wearing my glasses since I was 10 and I wear them all the time. I can’t live without them. ‘I’ve got about 20 glasses and I love changing them to go with different outfits. There’s so many styles to choose from, specs a great way for people to express themselves through fashion. All glasses wearers aged 16 and over across Washington and Sunderland just need to share a selfie and tell Specsavers what their glasses mean to them to be in with chance of winning the prestigious accolade. For every entry accepted, Specsavers will donate £1 to children’s anti-bullying charity Kidscape. Spectacle Wearer of the Year has raised more than half a million pounds for Kidscape over the past ten years. The money raised helps support the charity in providing practical support to children and families affected by bullying. Seven finalists, plus a social media favourite voted for by the public, will attend a celebrity-packed awards ceremony in London, with one overall winner scooping the top award and cash prize. Specs wearers should get snapping and share their selfie at specsavers.co.uk/loveglassescomp. Deadline for entries is 30 June 2019.